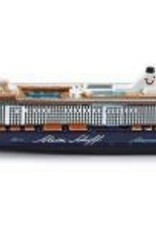 An up-to-the-minute addition to the theme of big cruise ships to the exceptional 1:1.400 scale. The extraordinary and inspiring design for the My Ship series from the TUI cruise series will be continued in spring 2014 with the launch of the third vessel. 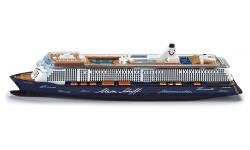 SIKU accompanies this event with a custom-fit model cruise ship  My Ship 3. The metal stern and plastic body feature exquisite original detail and eye-catching My Ship typical colourful paintwork with blue and white stern. The model does NOT float.